Slips, trips and falls together represent one of the most frequent causes of injury at work and at home. Falls alone comprise a large percentage of work-related injuries and an increasing proportion of accidental deaths in later life. Since we have little or no control over our reflex actions when we fall, it’s wise to be aware of objects and conditions that cause falls. Uneven terrain can be dangerous due to areas with severe slope, holes, tree roots or rocks in your path. Twisted ankles and knees are the price to be paid for not keeping a sharp eye out while on uneven terrain. There’s one primary tip that can help: Keep an eye on the ground. This sounds overly simplistic but foresters who are cautious about their foot placement will likely avoid ankle and knee injuries. When walking downhill/downslope, walk perpendicular to the hill, taking shorter strides and going slowly while remaining cautious of obstacles. Watch for the “step and fall.” This occurs when the front foot lands on a surface lower than expected, like stepping into a hole or when stepping onto an object, turning the ankle. Hiking sticks can also help provide stability on hills, relieve stress on the back, knees and legs, help move aside brush and branches, and help test unknown ground before walking. Many injuries are the result of falls on ice-covered or slippery ground, streets and sidewalks. Be sure your boots have adequate tread and the soles aren’t worn. Shoes that have smooth surfaces increase the risk of slipping. Walk cautiously on wet or frozen areas. Use your arms to keep you balanced, and avoid carrying heavy loads that challenge your sense of balance. Walk consciously. 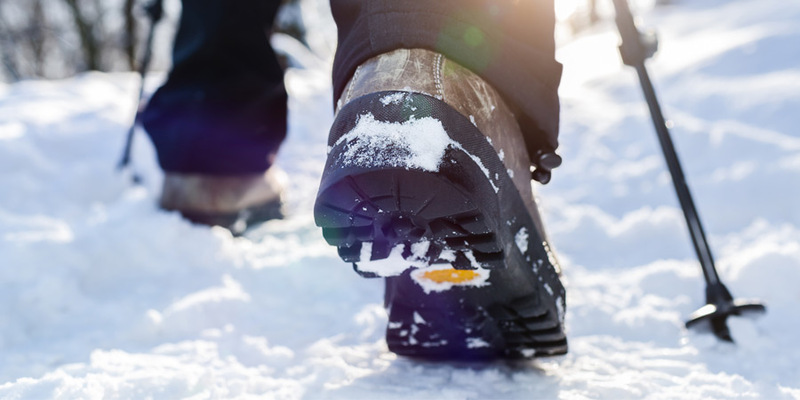 If icy conditions exist, use boot cleats, chains or traction-enhancing shoe gear. They slip on and off easily and allow you to walk safely on ice, wet leaves, mud and snow. Please include attribution to acrt.com with this graphic. 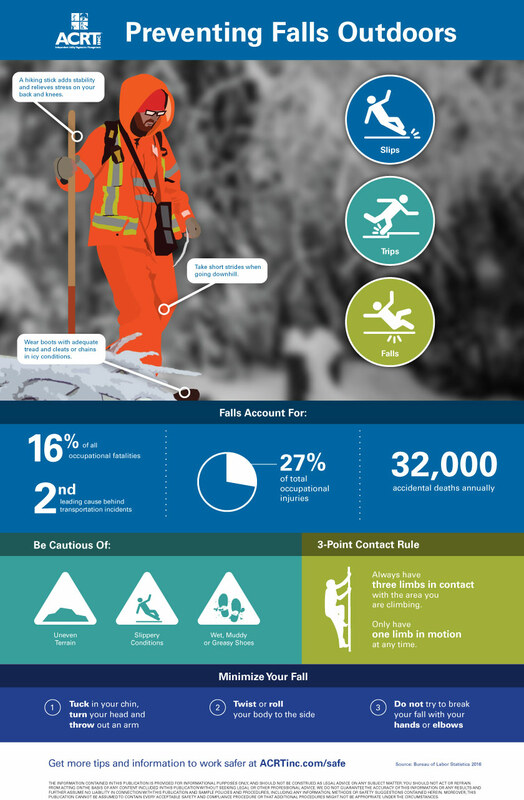 The Three-Point Contact Rule is a simple and effective way to minimize the risk of falling. This can be used in many situations: entering/exiting a truck cab, climbing into/out of the bed of a truck, using stairways and ladders, and climbing or descending steep slopes. Essentially, the Three-Point Contact Rule states that three out of four critical points of your body (hands and feet) are touching the area you are climbing into or out of, or are in contact with, at all times. This could be two hands and one foot or two feet and one hand. Break three-point contact only when you reach the ground, are on a stable location or when you’re safely in your vehicle. What types of behaviors lead to falls? In addition to wearing the wrong footwear, specific behaviors can lead to slips, trips and falls. Walking too fast or running is a major problem. Rapid changes in direction create a similar problem. Other problems are distractions, not watching where you’re going, carrying materials that obstruct view, wearing sunglasses in low-light areas, and failure to use handrails. These and other behaviors—caused by lack of knowledge, impatience or bad habits developed from past experiences—can lead to falls, injuries or even death. What is the Three-Point Contact Rule? Explain how it’s used. The Three-Point Contact Rule can significantly reduce the chances of injuring yourself through a slip or fall while climbing ladders or while entering or exiting a vehicle, climbing stairs, etc. Three-point contact means that three of your four limbs are in contact with the ladder, vehicle or handrail at all times—either one hand and two feet, or two hands and one foot, depending on the situation. Basically, only one limb is in motion at any one time. How could the Three-Point Contact Rule be used when getting into and out of a truck bed? When getting into the bed of a truck, grab the gate and/or side wall of the truck bed with both hands. When getting out of a truck bed, hold onto the gate and/or side wall of the truck with both hands and step down backward. Never jump or fall down forward. Knowing how to avoid falling is important. How can you protect yourself from injury if you’re in the act of falling? Tuck your chin in, turn your head and throw an arm up. It is better to land on your arm than on your head. While falling, twist or roll your body to the side. It is better to land on your buttocks and side than on your back. Keep your wrists, elbows and knees bent. Do not try to break the fall with your hands or elbows. When falling, the objective is to have as many square inches of your body contact the surface as possible, thus, spreading out the impact of the fall. ACRT is the largest independent utility consulting company in the U.S. and empowers utilities to proactively manage vegetation across their entire rights-of-way. We consistently stay on top of and share relevant industry content with our employees and customers around the country. We are all about people, and we put safety first. Ready to work with our well-trained team?